Every one of our faculty members has extensive experience in the fields in which they teach, and New York City is one of the world’s greatest resources for guest instructors and lecturers. You will work with the latest HD/UHD-4K cameras and leading editing, audio, design and post-production software. 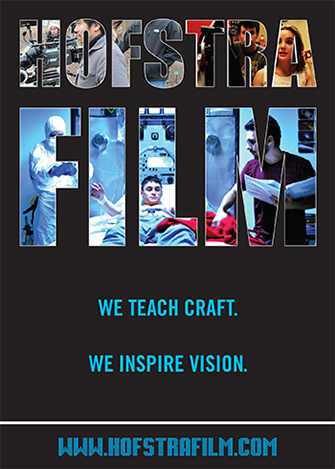 Choose from a variety of electives that allows you to focus on directing, producing, screenwriting, cinematography, 2-D and 3-D animation, visual effects, and digital post-production. Hofstra University is located 45 minutes outside of the greatest filming location in the world; New York City. This means that you have access to fantastic resources and opportunities for internships and employment. We offer three production spaces, including Studio A, a three-story, 3,750 square-foot studio, along with a newly built digital post-production suite.